It happens to even the most careful of patients: you take a fall, get hit in the mouth by accident, or haven’t been the best at brushing your teeth. No matter what the situation was, the result is the same: you have a knocked out or broken tooth, broken dental appliance, or have jaw pain at the TMJ joint. In emergency cases like these, it’s important to know what to do and where to seek help. In Havre de Grace, Dr. Grubb offers emergency dental services for when you need it most. What Happens in Emergency Dental Care? Like in the scenarios mentioned below, accidents happen, and sometimes your teeth can become damaged. We have seen patients who have cracked or broken parts of their teeth, or have knocked out their tooth entirely. 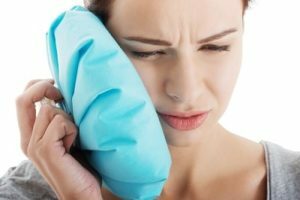 Other times, there have been cases where the patient wakes up with piercing pain in the tooth or jaw joint (TMJ symptoms), and is seeking relief. Should any of these occur to you, the first step is to stay calm. Next, contact our office at 410-939-5800 and we’ll schedule you in as soon as possible to be examined. In the meantime, we’ve analyzed the most common injuries that we’ve seen and what patients should do in these emergency situations. If you are experiencing an emergency, such as bleeding profusely and trauma to your jaw or face, we advise that you go to urgent care or the emergency room before giving us a call. Once you are taken care of, we’ll be happy to help you with dental repairs. TMJ stands for Temporomandibular Joint Disorder. This condition may develop differently for all patients, but the results are similar: jaw pain, soreness, headaches, ear pains, and more. Patients may not realize that they have TMJ until the symptoms have intensified. If you suddenly find that your jaw pain, soreness, or headaches are not going away, they could be tied to problems with your temporomandibular joint. Schedule an urgent visit with us for pain relief and to pinpoint the source of your pain. If your tooth was traumatized and has been broken or cracked, schedule an appointment with us as soon as possible. We’ll take a look at your damaged tooth, assess the damage, and commence with a treatment that can restore the shape or function of the tooth. If the tooth is too damaged, we may recommend that a crown be placed over the tooth to protect it. Cracked teeth may benefit from a filling or dental bonding to cover up the flaw. Patients who lose a tooth are often the most disheartening emergency cases we see. Patients have perfectly healthy teeth knocked out, fall out, or severely damaged due to other circumstances. But not all is lost. If you still have the tooth, bring it with you to your emergency appointment. Preserve the tooth in a glass of lukewarm water or milk. We will assess the damage of your tooth loss, staunch any bleeding, and immediately start you on the path to treatment, if you desire. We can restore your smile through two methods of tooth restoration methods. Dental Implants: Dental implants are artificial teeth that can be placed directly into the jawbone. They are made of biocompatible titanium, which is harmless for your bone and tissues and makes it ideal for a clean dental treatment. Dental implants are topped with a porcelain crown, designed to blend into your smile like a natural. Even though the process requires a little more time to complete, as a whole patients have been most satisfied with dental implants due to their permanence and durability. Dental Bridge: Dental bridges are much quicker to make and place, as they do not need to be placed into the jawbone. Instead, bridges are three crowns that are fused together and are supported on the adjacent teeth around the gap in your smile. But in a similar way to implants, we work hard to ensure that the bridge looks and feels as normal as your other teeth. Do you actually have a fear of the dentist? You’re not alone; in fact, we’ve had many patients who realize they’re in need of emergency dental care, but are terrified of the dentist or of the treatments they would need. If you are one of those who fear the dentist, rest assured that Dr. Grubb’s advanced experience in IV sedation can help. Making sure that your oral health is in good shape is critical to your health, so when you’re experiencing a dental emergency, don’t let your fear be an obstacle to getting the care you need. IV sedation is administered through a vein in the arm or hand, and is controlled throughout the duration of your treatment. Contrary to common belief, IV sedation does not “put you to sleep”, but instead you enter into a deep state of relaxation. You can still communicate with Dr. Grubb and our team, but will have no memory of the procedure. If you have broken a tooth, lost a tooth, or have debilitating jaw pain, contact us for an emergency visit as soon as possible. We’ll help decide on what treatment is best for you and your situation, and get you back on track towards a healthy smile here in Havre de Grace, MD.